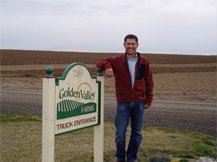 Golden Valley East, near Silverton, OR, is Darrin Ditchen’s family farming operation and one of the original contributors to Farmers Ending Hunger. (Golden Valley Farms, the home operation, is in the Willamette Valley.) Together with four other growers, they donated 173,000 pounds of frozen peas to the Oregon Food Bank in November 2006. 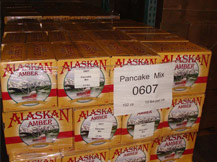 Donated pancake mix ready for distribution. When Farmers Ending Hunger turned its focus to wheat in 2007, Darrin stepped up with 350 bushels enabling the organization to partner with the Oregon Wheat Foundation and other wheat growers to donate a combined 17,000 bushels. Participation at the next level by Continental Mills and Pendleton Flour Mills produced 90,000 pounds of pancake mix that was donated and delivered to the Oregon Food Bank in December 2007.